Probiotics are essential to keep your whole body healthy and happy. Your gut is your gateway to everything else health-related in your body, and that's where probiotics start their work. Heal your gut, heal all of your systems. And so much more. Keep reading below! "In many ways, your gut bacteria are as vast and mysterious as the Milky Way. About 100 trillion bacteria, both good and bad, live inside your digestive system. Collectively, they're known as the gut microbiota. Science has begun to look more closely at how this enormous system of organisms influences—and even improves—health conditions, from heart disease to arthritis to cancer. But understanding how the gut microbiota works, and how you may benefit, can be daunting. This is a new frontier of medicine, and many are looking at the gut microbiota as an additional organ system," says Dr. Elizabeth Hohmann of the infectious diseases division at Harvard-affiliated Massachusetts General Hospital. "It's most important to the health of our gastrointestinal system, but may have even more far-reaching effects on our well-being." Why are Vibrant Biome Probiotics the Best Probiotics Available? Higher potency, 96 billion live microflora per serving. 22 of the most effective probiotic strains. Guaranteed best price per Colony Forming Unit (CFU). First ever bulk pricing on high potency probiotics. Arrive alive, no refrigeration needed. Not diluted with maltodextrin like 90 percent of all other probiotics. Leading-edge formula with more sporebiotics than any other formula available. Prebiotic-boosted with Organic Artichoke Inulin. "I feel much more aliveness from Sarvaa probiotics than I've ever felt before! Frankly, many probiotics on the market are just too weak to do any good. But these are truly clinical-grade potency. I'm prescribing this to almost all my clients and it's given them relief from a surprising number of issues. Thanks again." Sarvaa Vibrant Biome Probiotics-96 is your healthiest choice for receiving the highest grade probiotics currently available anywhere! Vibrant Biome Probiotics-52 and Vibrant Biome Probiotics-96 are the two most exceptional probiotic supplements that you'll find on the market. So what's the difference between them and how do you know which one to choose? Both will likely upgrade your gut health and overall aliveness to an astral level! Both help with Intestinal Permeability like Leaky Gut Syndrome and have the same 22 live, super-viable and highly-intelligent Bacillus strains. A key difference is that Vibrant Biome Probiotics-52 includes L-Glutamine in the formula. L-Glutamine is an essential amino acid that is part of what helps rebuild the sensitive lining of your intestines. Vibrant Biome Probiotics-96, on the other hand, is for those who are looking to streamline into a higher potency of probiotics. With 96 billion active Colony Forming Units, there is no L-Glutamine component. However, you receive such a tremendous amount of sporebiotics that you'll find yourself sitting up a little straighter day after day. Continue reading to learn more about this outstanding combination of probiotics. What are Sporebiotics? Why so Potent? Sporebiotics are unique microflora that produce healthy "bacteria seeds". They grow into thriving microflora in your lower GI tract, where they're really needed. Sporebiotics are some of the most potent good bacteria in your gastrointestinal (GI) tract due to their robust nature. They are not fungus; "Spore" refers to the shell around the bacteria during their "seed" state. They have a 98 percent survival rate as they pass through your stomach acids. Sporebiotics arrive alive! No refrigeration needed! Fully viable for over ten years without refrigeration! They are Bacillus strains, and are ancient, highly evolved Soil Based Organisms (SBOs). Sporebiotics are also "leader cells" that clear out bad bacteria and rebuild your gut health quickly. "Honestly, at first I was skeptical. During my 27 years of practice, I've seen so much hype in the supplement realm that I'm very leery of hype vs substance. Luckily, Sarvaa Probiotics are the best I've seen in the last ten years, which has been a period of rapid progress in probiotic research. They're 700 percent better potency than the next best clinical probiotic on the market. And I appreciate the fact that the first five ingredients are Sporebiotic strains. The other strains are excellent, too. Now that I've been using them myself, and seeing such excellent results with my patients, I'm more convinced than ever." 96 billion live beneficial bacteria. 74 billion are the ultra-potent Spore Forming Units (SFUs) aka Sporebiotics. Sporebiotics are beneficial spore-forming bacteria (Sporebiotics have nothing to do with fungus). 22 billion CFU of other critical, potent strains for optimal gut health. Sporebiotics are the most highly evolved probiotic microflora. They survive our stomach acid, are unaffected by heat, and are good bacteria warriors that remove bad bacteria, while encouraging beneficial microbiota to thrive. How do they do all this? First of all, they are unique in that they reproduce by creating healthy "bacteria seeds." These "bacteria seeds" are not fully formed bacterial cells, which make them impervious to conditions of heat or rough handling during transport. As they're consumed, 98 percent of these smart little "seeds" endure your stomach acid and are able to sprout further down in your GI tract. The "bacteria seeds" flourish and thrive where they're needed most and create numerous essential nutrients to keep you healthy and happy! Bacillus Strains: Guaranteed to Survive Stomach Acid and "Arrive Alive" in your Lower GI Tract where you really need them! Bacillus probiotics are Soil Based Organizisms (SBOs) and are immune to high temperatures and rough handling. Bacillus SBOs such as B. coagulans, B. subtilis, B. clausii, B. mesentericus, and B. indicus are the most research-proven strains. Bacillus strains are proven to clear out the bad bacteria, bad yeast fungus like Candida, and make room for the good microflora. Bacillus bacteria help digest resistant starches (RS) in your gut and turn that starch into essential nutrients that improve all aspects of your vitality. Lactobacillus Strains: Your ally for Healing Leaky Gut, Promoting Healthy Skin, Vaginal and Prostate Health, and more! 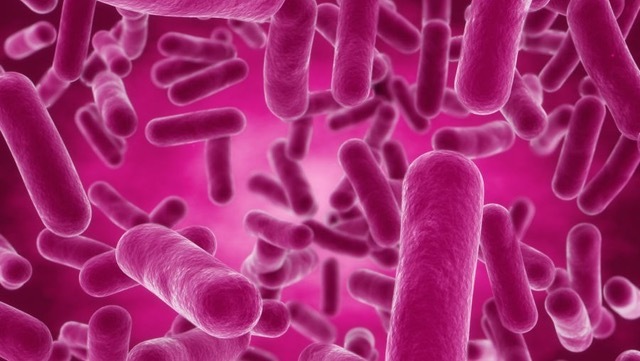 What are Lactobacillus Strains? What are the Benefits of Healthy Strains? Lactobacillus is a genus of bacteria, most commonly found in healthy humans, that aids in the production of healthy lactic acid. Vibrant Biome Probiotics-96 includes: L. rhamnosus, L. casei, L. plantarum, L. bulgaricus, L. acidophilus, L. paracasei, L. gasseri, L. salivarius, and L. brevis. Effective at countering the presence of candida, cavity-causing bacteria, and eradicating H. Pylori. Supports healthy lining of your digestive tract and lower Intestinal Permeability (aka leaky gut). Helps maintain vaginal health, pH, and urinary tract health by controlling urinary and vaginal infections. Essential for prostate health, helping prevent and manage common prostate conditions such as prostatitis and benign prostatic hyperplasia (bph), and may play a part in reducing prostate cancer. Known to counter eczema by producing anti-inflammatory cytokines. Reduces your gas and bloating by promoting healthy fermentation in your lower GI. Support your upper and lower digestive tract! Help your body produce and absorb healthy vitamins and minerals! Lower presence of IBS. Soothe diarrhea, too! Bifidobacteria: Bacteria that Support your Immune Function, GI Tract Health, Dairy Intolerance, and more! What are Bifidobacteria Strains? What are the Benefits of Healthy Strains? Bifidobacteria is a genus of bacteria that helps maintain healthy homeostasis in the human digestive tract! 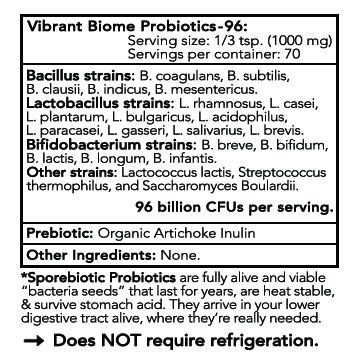 Vibrant Biome Probiotics-96 includes: B. bifidum, B. breve, B. lactis, B. longum, B. infantis. Helps maintain healthy digestive lining. Helps turn plant-based carbohydrates into healthy energy for your cells' use. Helps turn milk and dairy-based carbohydrates into healthy energy for your cells' use. Helps your body maintain healthy immune function. Contains 15-20 different research-proven probiotic strains. Delivers 50 billion Colony Forming Units (CFU) per serving or more. Are priced less than $1 per serving of 50 billion live bacteria, or $2 per 100 billion CFU. Contains at least four strains of Sporebiotics, i.e. Bacillus Subtilis, Bacillus Coagulans, etc. Are shelf stable and temperature resistant. Includes a prebiotic "food" to ensure the effectiveness of the beneficial bacteria. Are free of cheap fillers and flow-agents, such as maltodextrin or corn starch. Are free of allergens such as dairy, soy, wheat or corn starch. What Makes Sarvaa Probiotics Unique? Two times the number of servings found in most big name probiotics! 13 times the CFU potency of the four leading Sporebiotic-rich probiotic supplements! Minimum of 70 servings at 96 billion CFU per 1/3 teaspoon. Or, you get 140 servings at 48 billion CFU per 1/6 teaspoon. No fillers, binders, maltodextin, or capsules to swallow. Bulk pricing on the absolute best quality probiotics. Safely store in temperatures up to 118 degrees! Sporebiotics (SBOs) are more expensive to produce, so most companies cut corners and use them in very tiny amounts to increase their profit. But since Sarvaa runs more like a non-profit than a typical supplement company, we're setting the new standard for affordability of Sporebiotic-rich formulations of probiotics. Probiotics are one of the most effective and simple ways for keeping your body healthy. According to Johns Hopkins researchers, 80 percent of your immune system lives in your digestive tract! So keeping your gut full of beneficial bacteria ensures that you will be at your best health! Good bacteria in your digestive system helps you to digest food, absorb nutrients, and boost your immune system, making probiotics one of your best tools for reaching and maintaining thriving health. You're getting the highest quality, most effective strains, and highest CFU count at "bulk pricing" with Vibrant Biome Probiotics-96! Includes Organic Prebiotics to feed your good bacteria and ensure the Probiotics to thrive in your body. Doctor Recommended strains with higher potency assure you that you're getting the greatest benefits. Soil Based Organism Probiotics are guaranteed to boost your immune system! Inhibits the growth of many dangerous and damaging strains of bacteria in your gut. Helps body to digest resistant starches, fermentable fiber, lactose and dairy. Helps keep your body's pH lower, especially in presence of animal products. Decreases procarcinogenic enzymatic activities in the microbiota of the digestive tract. 1. Life Force. 60 percent of your cells are Microflora! Did you know that only about 40% of the cells in your body are regular human cells? The other 60% are tiny microflora in your gut! Think about this fact for a minute. It's true, 60% of the total number of cells in your body are these highly intelligent, quiet, yet powerful tribes of microbes! Many people that have digestive and intestinal issues carry lower ratios of beneficial bacteria and higher harmful ones. And if your personal make-up of microflora aren't at least 96 percent beneficial bacteria, then you simply can't live your healthiest life! Please don't underestimate the "leverage" this enormous community of tiny living beings has on your daily energy level, the robustness of your immune system, and even your mood and the quality of your sleep. 3. Probiotics strongly affect your DNA and Genetic Expression! Due to the fact that 90 percent of your genetics are in your gut, having beneficial bacteria supports a healthy genetic expression of your DNA and cells! This shows how important it is to make sure that the collection of bacteria in your body is hearty and vibrant, and contains only highly beneficial strains, leaving no room for bad strains to live or grow. By keeping the microbiome in your body consisting of mostly beneficial strains, you are ensuring that your inner ecosystem is working to bring you optimal health! These beauties digest the food you eat, turn them into healthy chemicals, hormones, vitamins and minerals. All this is then used by your cells to produce healthy energy for creating and proliferating your DNA! Wow! 4. Bacteria oversee much of your Nutrient Production and Absorption. There's a new term among scientists: Postbiotics. This term refers to all the critical nutrients that are created by your microbiome. It is being discovered that chemicals, hormones, and even vitamins and minerals are being made in your body by the bacteria in your gut! They not only produce some of these things, but they also aid in the absorption of them! Without a healthy microflora, good health is impossible. Dr. David Alta gives a powerful example: "Imagine for a moment that all of the trillions of microscopic beings in your body instantly got killed off by something. Within a few seconds, your gut would no longer be creating essential nutrients, you would no longer be able to digest or assimilate over half of what you tried to eat! And within hours your energy would decline rapidly. Then your mood would deteriorate dramatically because your essential nutrients such as Short-Chain Fatty Acids were no longer being created, your breath would get way worse, your sleep would be more disturbed, and finally, numerous ill-health symptoms would crop up and you'd certainly be in the hospital running up huge bills as they ran test after test to try to find out why you were literally falling apart at the seams!" Friendly flora help digest your food and they also produce so many important chemicals and nutrients that your health and vitality depends upon. Most of your immune system is found in your gut where it is a single-cell-thick coating along the inside of your digestive tract. It closely relates with your microbiome 24/7. If you have a weak immune system, the fact that 90 percent of your contact with the outside world actually happens inside you, points you to the home of your immune system: your gut. The complex microcosm of your gut shapes the health of your immune system day by day, hour by hour, and bite by bite! As bacteria in your gut shift, they shift what is interacting with your digestive lining, and these shifts are therefore directly influence your immune system. As your gut becomes unbalanced, your digestive lining becomes altered and the cells can actually separate, allowing undigested food and nutrients to be absorbed by your tissues. Your immune system (already feeling stretched thin) does not recognize these particulates, and begins to treat them like it would treat threatening viruses, bacteria, and toxins. Eventually, a deteriorating gut and overworked immune system can lead to auto-immunity, where your immune system begins to attack your own tissues. All of this is greatly influenced by the bacteria interacting with your gut lining, which in time shift to become unhealthy strains. The good news is that by implementing a diet and lifestyle that supports the procreation of healthy bacteria, this spiraling health decline can be stopped, and science is proving that it can even be reversed. You already know that exposure to all kinds of allergens places a large load on your immune system. From pollens to pollutants, your immune system is working overtime. Yet the biggest workload for your immune system is typically what is occurring in your intestinal tract. From bad foods to lack of good bacteria, your digestive system is making your immune system work even harder. You've heard that over 70 percent of your immune system resides in your gut. Therefore, your ability to give yourself powerful allergy relief begins with the health of your GI Tract. So anytime you do anything to support your gut health, you automatically reduce the strain that allergens and irritants are placing on your immune system. This supports your organs and helps your immune system to calm down, reducing the likelihood of a triggered inflammation response which causes allergies. Functional medicine is proving that many health imbalances like allergies aren't something that just 'happen' to people, but are symptoms of a deeper imbalance in your digestive tract. Here's the truth: most allergy strategies are not getting to the core issue of gut health. Simply put, our gut is asking us to rebuild and restore our microbiome to its vitality. Then your immune system isn't bogged down by gut issues and it can easily process whatever airborne allergens or food allergens you're exposed to. Many excellent studies show the increased effectiveness of Probiotics when administered along with high grade Prebiotics. What are Prebiotics? In simple terms, they're health-food for beneficial bacteria as they journey through your intestinal tract. We've included the best Prebiotic there is to feed and support all the beneficial bacteria in you GI tract. This Prebiotic is Organic Artichoke Inulin, which is one of the absolute best sources of "RS". RS stands for Resistant Starch, which are starches that are resistant to the digestion of our upper digestive tract, and move to reach the large intestine and colon where they are 'eaten' by bacteria through fermentation. Fiber present in Organic Artichoke Inulin is fermented in the lower GI and is an important part of feeding healthy bacteria that in-turn help you to be vibrant. 8. The Real "Behind the Scenes" Story of the Probiotics Industry. First off, most probiotics on the market are diluted with large amounts of maltodextrin and other "flow-agents". Why? Two reasons: one is that profit margins increase. Maltodextrin is 92 percent cheaper to produce than even the least expensive strains of beneficial bacteria, which must be grown in carefully controlled environments. Secondly, because government agencies still consider maltodextrin to be a harmless sugary starch and it does not have to be disclosed on probiotic labels. Maltodextrin and other "flow-agents" like silicon dioxide are included in large quantities so the actual probiotics don't clump together. Clumping prevents pill manufacturers from making mass-produced probiotic pills by the thousands! But it typically only takes ten percent of these flow-agents to help the machines run smoothly. Due to greed and other factors, they include these flow agents to be up to 49 percent of the supplement that you're putting into your body. But when you're using your hard-earned dollars, do you really want to be paying probiotic prices for large amounts of hidden fillers and anti-caking agents? These companies also focus mostly on cheap, mass-produced strains. Why? Again, the excessive drive to make huge profits. Have you ever wondered why so many probiotics are only 10-15 percent effective? The data shows that many of these cheap strains will not retain full potency during transportation to the store, nor will many bacteria survive the acids in your upper GI tract. Therefore good bacteria will not arrive in the lower intestine where they're so important. Sarvaa Probiotics include 22 strains of durable, shelf-stable strains that need no refrigeration and are the most robust probiotics for surviving stomach acids. Sarvaa Probiotics have a much higher CFU count then most Probiotics that have a significant portion of Sporebiotics. These are very special SFB (Spore-Forming Bacteria) strains such as B. coagulans, B. subtilis, B. clausii, B. indicus, and B. mesentericus. These strains of probiotics are essential to include because many excellent studies show that they're not affected by heat up to 120-130 degrees! This is very rare among beneficial bacteria. Therefore, these helpful microflora easily survive transportation and can even be stored for years. It gets even better! These special Bacillus strains also excel at passing unharmed through the acids in your upper GI tract! This means that not only will they survive stomach acids, but these potent probiotics will grow nicely all the way down your GI tract! Sporebiotic "micro-miracles" are true powerhouses at removing any harmful microbes and pathogens you've collected over the years. This removal of the bad bacteria creates space for all the good microflora to flourish and enhance your health and well-being! Anti-inflammatory support may lead to less fatigue and greater mood support. Better micro-flora can stabilize hormones, stress levels, and the endocrine system. A healthy Microbiome will speed your recovery after an illness, intense exercise, or a busy day. Balance and alkalize your blood pH. Good bacteria cleanse your body, balance hormones, and support internal organs. Boost your immune system with Bioavailable Vitamins and Short Chain Fatty Acids. Support weight management by reducing cravings that are created by bad bacteria and bad fungus like Candida. A huge benefit of probiotics is that your overall health and vitality goes up, because the beneficial bacteria do so much for you. How does my Gut Bacteria help me? There's over a hundred important reasons why you want a vibrant Microbiome (GI Tract microflora)! But let's look at just a few of the benefits you'll reap from a healthy gut: 1. Increased Immune Response. 2. Better Stamina. 3. Improved Mood. 4. Reduced Cravings. 5. Less Doctor Visits. 6. Better Sleep. 7. Reduced Food Sensitivities. 8. Less Joint Stiffness. 9. Reduced risk of autoimmune diseases. 10. Decreased Inflammation. 11. Healthy Hormone Balance. 12. Lose Weight. 13. Better Focus and Mental Clarity. 14. Fewer Allergies. 15. Avoid numerous diseases that would cost you thousands of dollars and a great deal of pain and suffering. Probiotics are no longer in the realm of just Naturopathic Doctors. Every year, thousands of MDs who are frustrated that their patients are not getting better with pharmaceuticals, are leaving the drugs behind and retraining in holistic approaches. Science is rediscovering that developing a "healthy gut" is one of the most potent methods for obtaining and sustaining optimal health. This is because by actually healing the gut, we are healing the underlying causes of hundreds of maladies! The Human Microbiome is now at the forefront of scientific research. All branches of health research are diligently studying every aspect of what makes your digestive tract happy and functioning optimally. Dr. William Cole says, "The microbiome is home to around 80 percent of your immune system, and 95 percent of your "happy" neurotransmitter, serotonin. Often called your "second brain," it helps control your mood, weight and hormones." By now you may have heard that your body has more cells of microflora in your gut than the rest of your body combined. Think about that. As each cell plays an important role in our vitality, it's not a matter of, "It would be nice to have good gut flora". It's an absolute necessity! How is this possible? Microbiome cells are much smaller in size. Still, the experts tell us that we have between three to five pounds of microflora in our gut. Amazing, considering that your heart weighs about one pound, and your brain weighs approximately three pounds. Your microbiome could weigh more than your heart and brain combined! Truly remarkable! And also truly essential data to help you deepen your commitment to the health of your "second" brain, your community of microflora! The Microbiome Project versus The Human Genome Project. The Human Genome Project didn't end up solving very much of what ails humanity. In contrast, researchers are now projecting that at least 60-70 percent of what ails Humanity is related to gut health! The Microbiome Project was launched years ago to accelerate the research and development of this exciting field. Gone are the days when medicine could discount the importance of your personal microbiome. The Microbiome Project confirms that the microscopic bacterial colonies, which live in your digestive tract, play an absolutely critical role in both your physical and mental well-being. Healthy gut bacteria is considered fundamental to overall health, including healthy weight, mood, energy and mental function. In 2015, a Cell Journal study showed that although serotonin is known as a brain neurotransmitter, approximately 90 percent of the body’s serotonin is cultivated by certain bacteria in the digestive tract. Emerging science is showing that the gut essentially acts as our second brain. Combining the functions of the Microbiome with the Enteric Nervous System, the highway where much of our physical and emotional communication is sourced reveals itself. An estimated 500 million neurons (Wikipedia ENS) reside in the gut, acting as avenues of communication. Digestion is the breaking down of food to nutrients, which the body then utilizes to nourish, repair cells and provide energy. A healthy gut promotes good immune function and produces beneficial bacteria in the digestive system. This creates a positive effect on vitamin and mineral absorbency, hormone regulation, the ability to eliminate toxins, mental health and of course, digestion. Have your Happiest Gut ever! Naturally! Probiotics, prebiotics, fiber, enzymes, fermented foods, and other natural ingredients all help to increase your good bacteria and boost digestive health. Probiotic products provide your gut with billions of good bacteria. Prebiotics, on the other hand are supporting ingredients developed to feed your beneficial bacteria. Prebiotic ingredients include inulin, fruits, vegetable fibers and fructooligosaccharides (FOS). Inulin is a type of fiber found in plant-based foods and is widely used as a prebiotic agent in many functional foods and supplements. Large amounts of helpful inulin can be found in certain plants and herbs. Some of the best are the dark leafy greens such as Dandelion Greens, Moringa Leaf, Kale, Lettuce, Nettles, and Sea Vegetables. Many types of fruit are good prebiotic sources, including Berries, Apples, Pomegranates, and Rose Hips. Baobab fruit is also an excellent source of prebiotic inulin. Don't forget the excellent prebiotic fiber found in organic nuts, seeds, legumes, squashes, and all vegetables. The best fiber-containing seeds are: chia, flax, pumpkin and hemp. Some of the best nuts for fiber are: cashews, almonds, walnuts, pecans, and brazil nuts. Always buy organic nuts and seeds and look for them in the cooler section of the store, not on the store shelves where the oils can go rancid at room temperature. You've heard plenty about the benefits of fermented foods like sauerkraut, kimchee, miso, kefir and yogurt, but not all fermented foods are equal. The most bang for your buck and the least impact on the Earth is going to be with all the plant-based fermented foods. Start with sauerkraut. Buy and consume a variety of organically grown, unpasteurized sauerkrauts. Try out a couple of different types of miso; just be sure you don't let the temperature of miso (or any fermented foods) get above 115 degrees (F) so as not to kill off any of the helpful microflora. Another excellent source of microflora is kimchee, which is offered in a wide variety of flavors and veggies. Be sure to look for some of the new concentrated, fermented liquids like Gut Shot or Inner-Eco. They're much more beneficial and cost effective than most of the "single serving" drinks like kombucha (which are 98 percent water and use far too much plastic or glass for the tiny benefit offered). Inner-Eco is super tasty and one jar makes 30 servings! Yogurt may be one of the most overrated and overpriced "health foods". Why? Because there's a relatively small amount of good bacteria in yogurt, and many of the strains in yogurt are not the best at surviving the stomach acid and arriving where you need them. When you factor in the negative impact the cattle industry is having on the planet and the animals, yogurt may not be worth your money. All of Sarvaa Superfoods include excellent Prebiotics. First off, all Sarvaa Superfoods contain both types of the beneficial Dietary Fibers: Soluble and Insoluble Fiber. Your Microbiome depends on both types of Dietary Fiber every hour of every day of your life! You're automatically covered with fabulous Prebiotics to support your best gut health ever! The SuperGreens, the SuperFruits and the "easy-on-the-gut" plant-based proteins all stack up in your favor! As well, all four Sarvaa Meal Replacements include Sarvaa Superfood's Custom Blend of Probiotics and Prebiotics. We've been researching the best options for probiotics for the last six years. We have gathered and blended the ideal balance of spore forming units and colony forming communities, ensuring that your probiotics reach their ideal home in your GI Tract. We've included the most important "Leader Strains" such as L. Plantarum to powerfully strengthen your immune response and bulk up your stamina. We also include the well-researched, potent strains known as Spore Forming Units, such as Bacillus Coagulans! This powerhouse probiotic is considered one of the most important for your lower intestines. It is able to easily withstand heat and acids, and therefore arrives in your lower GI tract ready to thrive where you need it the most. And most important of all is that by supporting your gut health, you'll feel more vibrant and avoid innumerable illnesses, thus enabling you to truly thrive and live in the abundance that is your birthright! Priced 13 times better than ANY other SPU-rich probiotics. Only Probiotics to take during antibiotics. Creates Probiotics and vitamins in your gut. Restore intestinal cell wall health. Replace Candida with beneficial bacteria. Reduce or eliminate food sensitivities. Reduce or eliminate allergies and Hay Fever. Improve skin health and radiance. Increase mental health and clarity. Improve emotional health and stability. Recover faster from illnesses, surgeries or intense exercise. 1. Why are Sarvaa Probiotics Higher Potency? As stated above, most probiotics on the market are diluted with large amounts of maltodextrin and other "flow-agents". Profit margins for other companies are much higher because maltodextrin is 92% cheaper to produce than even the least expensive strains of beneficial bacteria. Add in that government agencies still consider maltodextrin to be a harmless sugary starch and it does not have to be disclosed on probiotic labels, most companies producing probiotic supplements can get away with a lower potency product. Sarvaa Superfood keeps the ingredients pure. The other major factor that Sarvaa is able to share high potency probiotics is the fact that we don't spend big money on marketing. We put all our resources into making the best quality products at fair prices and let word of mouth spread the message. This is the opposite of most supplement companies who spend up to 50 percent of their budgets on marketing, and consequently the quality of their products suffer. So that's the quality. Now let's talk quantity: For the first time ever, you can now buy super high potency probiotics in bulk. A typical bottle of probiotics only contains 9-13 grams of actual probiotics in 30 capsules. And the CFU count ranges from 5 billion to 50 billion. With Sarvaa Vibrant Biome, you get 70 grams of pure and potent probiotics in each jar which is equivalent to at least five bottles of other manufacturers' probiotics. Then factor in the higher potency, and one jar of Sarvaa Probiotics often ends up replacing around nine bottles of other probiotic products. When comparing, be sure to check for a significant presence of Sporebiotic strains of probiotics, or else you won't be comparing correctly. A. Price. You get way more potency and sheer quantity of actual probiotics because you're essentially buying in bulk instead of in capsules. And since there aren't the extra costs associated with encapsulation supplies and equipment, your hard-earned money is going to probiotics instead of those other factors. B. Flexible dosages. Let's say you have to take antibiotics for some reason and want to be sure you're keeping the good bacteria strong and well proliferated in your gut. You could easily decide to take a greater amount for a couple of weeks to be certain your microbiome wasn't becoming deficient in any way. Or, perhaps you've already done a bigger dose for a few weeks and want to save some money and do a 3/4 dose each day so that your jar lasts longer. C. Purity. Your body doesn't need gelatin capsules or cellulose capsules. Your all-important Microbiome needs probiotics. And some pre-biotics to ensure that the beneficial bacteria are well-fed and start thriving. And because there aren't any high-tech encapsulation machines that need flow-agents added to the probiotics to help them flow rapidly into the capsules, you're getting cleaner, purer, higher potency probiotics than are possible in pill form. D. Sustainability There are a number of ways that you're contributing positively to people and the planet by buying you probiotics in bulk. Your purchase of one glass jar of Vibrant Biome is replacing as many as as dozen plastic bottles of typical probiotics that are usually carrying supplements in capsules. 3. Why the emphasis on the Bacillus family of Beneficial Bacteria? Great question. The Bacillus family of bacteria are some of the most highly beneficial bacteria in the human GI tract. Why? Because they're unique among the good bacteria. They're Soil Based Organisms (SBO) that survive heat and stomach acids and arrive alive in your Lower GI tract where they're most needed. This is because they enter your body in their larva stage, where they are encased in a shell that survives your stomach acid. In your lower GI, this shell hatches, and the Bacillus strains proliferate and begin their work. They digest sugars, fibers, and starches to create essential nutrients for you. These include: short-chain fatty acids that improve your gene expression, your hormone balance, your mood, your stress response-ability, reduce your susceptibility to allergies, improve your overall immune system function, along with many more potent benefits to your overall health and well-being. 4. What exactly is Bacillus? As we said above, Bacillus strains are unique soil based beneficial bacteria that are also unique because they are some of the only healthy gut flora that are Sporebiotic bacteria. Bacillus strains of Sporebiotics tend to be larger cells and they're much more robust than most strains of bacteria! They have the highest rate of survival during transportation and more importantly, they tend to have the highest rate of aliveness after passing through the highly acidic environment of your upper GI tract, and can easily populate your lower GI tract so that you have a thriving community of beneficial bacteria. They're a rare and special type of beneficial bacteria that are actually able to form a spore, or "seed", inside themselves instead of simply doing the typical cell division type of propagation of itself. Sporebiotics, aka Spore Forming Units (SFU), are considered a more advanced life form than most other good bacteria because of this powerful and highly intelligent survival mechanism. Therefore, they're able to do more powerful and intelligent work for you in your gut microbiome, too! 6. Why haven't I heard much about Sporebiotics? Until recently, they simply were not as well understood and people tend to stick with what they've heard of and are familiar with. But these last ten years have seen a huge body of research develop, showing the enormous benefits and the essential role that Sporebiotics play in the healthy microflora of humans. And as more studies show the great durability of these strains for easily surviving transport and storage, and how easily they survive your stomach acid, the more popular they're becoming--especially among experts, specialists and doctors who work with intricacies of the human microbiome. Also, Sporebiotics were more costly to grow and harvest, so they were not incorporated into probiotic supplements until recently, when the data became too overwhelming to ignore. Yet, due to their relative rarity and higher cost, most companies who make probiotics still don't include Sporebiotic strains, or they're only included in tiny, worthless amounts. 7. Spores sound like fungus. Why would I put that in my body? Yes, it's a common misconception. And while it's true that fungus are famous for reproducing via spores, some highly evolved good bacteria do also. But remember, the word "spore" is just a scientific term for seed. Think of these spores in the case of bacteria as "bacteria seeds." Most strains of beneficial bacteria are not Spore Forming Bacteria, the bacteria that do form spores are actually some of the most advanced and intelligent forms of healthy bacteria on the planet and are especially good for your gut. 8. What about Yeast Infections? Again, Sporebiotics are unique Spore Forming Bacteria. Although the word "spore" sounds like it might be fungus, the truth is that these are potent beneficial bacteria strains that are extremely helpful in eliminating harmful yeasts and any kind of unhealthy fungus overgrowth. And Sporebiotics, aka Spore Forming Units (SFU), are actually some of the most highly prescribed and science-proven strains for healing vaginal yeast infections and in the whole GI Tract. And sporebiotic strains are typically the best for all stages of the process, from the beginning to the end, of rebuilding all aspects of your overall microbiome to better prevent you from getting yeast infections! 9. Tell me more about Prostate Health and Probiotics. As you've been reading on this webpage, Probiotics are highly beneficial in so many realms of your body. Men's health is not excluded from these powerful benefits! Probiotics, especially the strains that are included in Vibrant Biome, are being shown to help prevent and manage common prostate woes, like prostatitis and benign prostatic hyperplasia, and may play a role in treating prostate cancer. What's really happening here is that high quality Probiotics are assisting in reducing inflammation and resisting infection. Some experts believe that an imbalance in bacteria in the uretha can cause prostatitis. Too many antibiotics in your system can also trigger disease. So including excellent Probiotics in your diet can help manage the bad bacteria and prevent them from finding their way into your prostate. 10. Why can’t I just eat yogurt? Only if you make your own yogurt at home that is noticeably "bubbly" and effervescent will your yogurt have a high enough presence of beneficial bacteria to make it qualify as an effective source of probiotics. Have you ever wondered why no yogurt brands actually tell you how much bacteria you're getting per serving? Ever wondered why there's never a CFU number on the container? It's because the numbers are so terribly low that it would be a big embarrassment to the companies to do so. Especially since a large number of the cheap yogurts have zero CFU so that they will have a much longer shelf life, and therefore make much more money for the manufacturers and the stores. Further, many of the bacteria present in yogurts have a very low survival rate when reaching the large intestine and colon. So even if the bacteria have survived long enough to enter your body, there's a good chance that they won't reach your lower GI where they are greatly needed. 11. Why are Sporebiotics usually so pricy? Sporebiotic Spore Forming Bacteria are more expensive to grow and require a higher quality and more expensive growth-medium. And Sporebiotics such as the excellent Bacillus strains are typically larger bacterial cells, and "take up more space" in a pill than the more typical bacteria you find on the market, so many supplement companies avoid them. And until recently, very few people were able to grow them in sufficient quantities to offer them in significant concentrations of SFUs. So if they're included in a probiotic at all, they're often in minuscule amounts simply for marketing reasons. For instance, for many years the most prescribed Sporebiotic probiotic by doctors has been Mega Sporebiotic. They were the leading edge for years, but you had to take two capsules to get only four billion CFU's. And a 30 day supply retails for $69. Incredibly expensive, considering the very low potency and only a 30 day supply. However, Sarvaa Probiotics give you over 52 billion SFU (and 96 billion total CFU) per serving, and a 70 day supply for the same price! You can do the math. Sarvaa Vibrant Biome Probiotics-96 are 13 times more potent and give you 70 day supply instead of 30 days! 12. Why are Sarvaa Probiotics so inexpensive? First, you have to understand several background factors. One is that Doctor's offices and health food stores mark up supplements by double or more. So that alone raises your cost a huge amount compared to buying direct. Second is the amount of money that supplement manufactures want to make at the expense of the consumer, who is typically not educated enough in these matters to make more informed decisions, so the companies can get away with outrageous profits. But now we're seeing some companies return to a more ethical and honest approach to high quality healthy food and higher quality, cleaner supplements. And then there are the 1 percent of small companies like Sarvaa Superfood that were founded on the "Super-Ethical" model of doing business, aka Sacred Commerce, that aims to simply use money as a practical tool to support the process of delivering the best quality at the lowest possible price, so that more people can take back their health from the Big Food and Big Pharma. It really boils down to ethics and "Dharma." 13. Are Sarvaa Probiotics compatible with fermented foods? Yes. However, for the first two weeks, one should be wise in the quantities of both that you're consuming. For instance, if you're in the mood to eat a large amount of your favorite fermented foods at breakfast, then it might be wise to use high potency Sarvaa Vibrant Biome later in the day, so as to avoid loose bowel movements, etc. 14. Is it true these don't need refrigeration? Don't they need to be cold to stay viable? Yes! As mentioned above, the strains of beneficial bacteria in both versions of Vibrant Biome Probiotics are shelf stable. However, if you prefer to keep them in your fridge, it won't harm them in any way. The only thing that could slightly degrade their quality is if you left them by a hot window, getting baked by direct sunlight for several days. 15. What is the difference between Vibrant Biome Probiotics-52 and Vibrant Biome Probiotics-96? The 22 strains of beneficial microflora are exactly the same. The primary difference is that Vibrant Biome Probiotics-52 contains 52 billion active Colony Forming Units (CFU) and Vibrant Biome Probiotics-96 contains a whopping 96 billion active CFUs! Vibrant Biome Probiotics-52 also contains L-Glutamine, an essential amino acid that helps in the repair of digestive lining. 16. How do I decide whether to get the 52 billion version or the 96 billion version? This can be a complex question to answer, because you have numerous factors in your background, and in the current state of your health, that affect your decision. You need to closely consider your unique desires and goals for reducing some of your personal health issues. And you'll also want to think about moving up the spectrum towards optimal health and well-being. Having said that, there's also the practical matter of your budget. But, most people would do well starting with the Vibrant Biome Probiotics-96 to potently boost their gut's microflora. 17. What if I want to do a "Therapeutic Dose" versus a maintenance dose? Great question. That's the beauty of getting to buy such high-grade Sporebiotic Probiotics in bulk instead of in pill form. You can easily decide to change your level of daily intake of probiotics based on what else is going on in your diet and your life. For instance, let's say you've been under extra stress, or say you were traveling and were not able to eat as well as you might have liked. And if you had to take antibiotics, you would probably want to increase your dosage by quite a bit for at least a few weeks to be certain that you've properly repopulated your intestinal flora in the best possible way. 18. Should I stop taking Probiotics when taking an Antibiotic? First, you should always consult your doctor about this topic. However, many leading-edge doctors and other practitioners are actually prescribing Sporebiotic types of probiotics to their patients. Why? Because all the good data points out that these Sporebiotic strains will continue to help you recover from whatever illness or foreign invader is in your body. And by taking Sporebiotic probiotics simultaneously with your antibiotic, you won't have to work nearly as hard to rebuild a healthy and thriving microbiome after you're done taking the course of antibiotics. 19. Will Antibiotics and Probiotics clash if I take them at the same time? The correct answer entirely depends on the strains in your probiotics. If they're Sporebiotic Probiotics, then you're in good shape. If not, you're not likely to do any harm to your body, but you would be wasting your money taking "old-school" probiotics that don't contain at least three high quality Sporebiotic strains such as Bacillus coagulans, Bacillus subtilis, and Bacillus mesentericus. 19. What about SIBO and Probiotics? Always consult your doctor if you have Small Intestinal Bacterial Overgrowth, aka SIBO. This can be a very complex issue to understand, so it's always wise to do your homework. Many SIBO specialists suggest waiting to re-introduce any probiotics or fermented foods until after you've cleared up the overgrowth of bacteria, especially clearing out any overgrowth in your upper GI tract. However, once you are ready to rebuild your microbiome with the best possible beneficial bacteria, then Sporebiotic strains are often considered the safest route to pursue. This is due to their innate quality of being in "bacteria seed" form. They are unlikely to contribute to any unwanted excess bacterial overgrowth in your upper GI tract and will grow from seed to full blown beneficial bacterial in your lower intestines, where you really need them to flourish. 21. Do Probiotics really help my mood? Strangely enough, yes! Actually, a resounding yes! Because 60-70 percent of serotonin is produced in your gut, that fact alone is proof that taking good care of your microbiome will help your attitude, outlook and overall resilience in the face of challenges. Also, the fact that the good bacteria in your lower GI tract are the little powerhouses that do the hard work of breaking down resistant starches and fermentable fiber that your stomach and small intestine are not designed to do. Why do you want them to do this work? Because this process is what you need every minute to create all the short-chain fatty acids you need minute by minute, day by day to be happy and healthy! If your system is struggling to create and absorb the much-needed nutrients like short-chain fatty acids, then your vitality and mood will be stressed as well! So happy gut makes a happy you! 22. Will I have to take Probiotics indefinitely? Again, this is entirely up to you and varies person to person. A vast majority of people on this planet are not receiving optimal nutrition on a daily basis, and including probiotics in your diet is a sure-fire way for you to stay at optimal health even on the days when eating at your best may not be feasible. But if you find that you are eating incredibly clean and getting plenty of food-based probiotics on a very regular basis, you may want to experiment with taking some time off from including a probiotic supplement in your routine. You are the expert on your body. And if taking a probiotic supplement every day helps you be your best you, then do it! Which of the following statements fit you best? I know that my gut has some real issues. My intestinal tract could probably use a little help. My microbiome is probably average. My overall gut health is a bit above average. My gut is vibrant and near perfect! How did you come up with your answer? Did you see a Functional Medicine Doctor? A Naturopathic Doctor? Did they run extensive blood tests and a comprehensive Stool Analysis that clearly show what level of Intestinal Permeability you have? If you had zero, you are among the lucky two percent of adults in America. Did you discover whether you had Intra-cellular Permeability, Extra-cellular Permeability, or both? What level of gluten sensitivity did the tests reveal for you? What level of parasites and pathogenic bacteria showed up? Lastly, what good bacteria were either low in your gut, or entirely missing? Once you've accurately assessed where you are on this spectrum of gut health, you can formulate your own course of action to dramatically upgrade all aspects of your GI tract health and watch most of your ailments diminish or even vanish completely! Your gut health affects every breath you take, every heartbeat in your day, and all your thoughts, feelings and moods! The vibrancy of your powerful microbiome is the starting point for everything from vitamin production, enzymatic action, pH balance, short-chain fatty acid production, and it's where you create the vast majority of your essential mood hormones such as serotonin. Vibrant Biome Probiotics-96 are the most advanced formulation of beneficial bacteria at the highest potency you can buy (96 billion CFU), at the best price anywhere! And Vibrant Biome Probiotics-96 includes high concentrations of leading-edge Sporebiotic strains; a "next-level" formulation of the most effective 22 strains! Benefits include rebuilding a damaged microbiome and maintaining optimal gut health to enhance all aspects of your energy and vitality, which spreads into every other aspect of your beautiful life! How do I use Vibrant Biome Probiotics? Typical Use: 1/3 level teaspoon once per day will give you 96 billion active beneficial bacteria. These are potent yet gentle probiotics that are designed for daily consumption. Occasional Therapeutic Use: 1/2 to 3/4 rounded teaspoon three times per day, or as recommended by your healthcare professional. Helpful Tips: Studies show that eating foods that contain good quality pre-biotics greatly enhances the ability of probiotics to do their job and populate your gut with the best possible beneficial bacteria. Please do your best to consume plenty of both raw and cooked vegetables daily. Also, try to eat some raw fruits with the lowest sugar content possible. For instance, do not eat fully ripe bananas, but eat them as green as you possibly can. And avoid large amounts of highly ripe mangoes and pineapples during any periods of "therapeutic doses" of probiotics when possible. Invest in yourself. For the first 10 - 14 days of taking Vibrant Biome, you will want to really "leverage" the benefits of probiotics by eating better than usual and supporting your body by getting extra rest. This way the most beneficial bacteria have an environment in which they can grow stronger and the bad ones ease their way out quickly. Be kind to yourself. Each one of us is an individual with different bodily needs. The pace at which you consume probiotics may be very different from the person standing next to you. If you find that consuming probiotics at the recommended dose is producing unfavorable results, such as excessive bowel movements, reduce your intake and then gradually increase it to the recommended amount of 1/3 teaspoon a day. Or you may want to start minimally from the beginning and gradually increase your consumption of Vibrant Biome Probiotics for the first 10 - 14 days. Learn about potent pre-biotics substances such as Resistant Starch (RS) and Fermentable Fiber (FF). RS and FF provide an ideal food and growing environment for good bacteria to flourish and for bad bacteria or bad fungus in your body to be released. Sarvaa includes RS in the form of Organic Artichoke Inulin in each Vibrant Biome Probiotic. To get more FF, eat more salads! Make stir-fry, mild curries, or stews with veggies like broccoli, cabbage, yams, fennel root, kale, onion, and garlic...and please do not overcook these! Eat your favorite beans and legumes. Eat fewer dairy products and less meat for a while because they contain no RS or FF. RAW! Gluten Free! Non-Dairy! Non GMO! No Fillers or binders! No allergens! No capsules! No flow agents! Easy to travel with, stable and effective...and doesn't need refrigeration. My go-to probiotic when I'm on the road...or in one stable place! I was suffering the after-effects from two months of taking antibiotics and was trying all kinds of probiotics to recover. I even bought the $69 little bottle of Mega Sporebiotic Probiotics that my doctor prescribed and said was the best probiotic to recover from antibiotics, but I felt nothing at all. My intestines felt dead and I was giving up until I got your 96 billion version. Wow, by the second day, my intestines felt alive and gurgling in a good way, and my bowel movements finally got better. I just had to tell you, since I'm so grateful. I would've given 5 stars but, I'm on an extremely tight budget. Honestly, at first I was skeptical. During my 27 years of practice, I've seen so much hype in the supplement realm that I'm very leery. Luckily, Sarvaa Probiotics are the best I've seen in the last ten years, (which has been a period of rapid progress in probiotic research). They're 700% better potency than the next best clinical probiotic on the market. And I appreciate the fact that the first few ingredients are Sporebiotic strains. The other strains are excellent, too. Now that I've been using them myself, and seeing such excellent results with my patients, I'm more convinced than ever." CACAO PLUS! - Organic Plant Protein Meal Replacement Powder. Chocolate + SuperGreens! GOLDEN BLISS - Ultimate Turmeric Powder, Anti-Inflammatory w/ Probiotics & Spices! HORMONE HAPPINESS - FOR WOMEN! Balance Hormones, Improve Mood, Stamina, Sleep, and Menstrual Cycle. PACHA PROTEIN - Organic Plant Protein Meal Replacement Powder + SuperGreens. ADRENAL ASSIST - Heal Adrenal Fatigue, Improve Stamina and Mood. Balance your Autonomic Nervous System. MAYAN CHOCOLATE - Organic Plant Protein Meal Replacement Powder. Chili Chocolate + SuperGreens!